← Amanda Holden For Coronation Street? Well soapsters, it looks like Gordon Brown isn’t the only one digging his heels in and refusing to go. 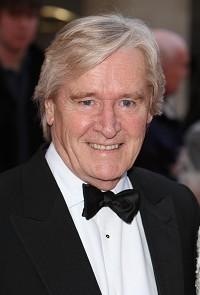 Apparently, Corrie icon Bill Roache has vowed that he’ll NEVER retire from the show that made him a star. Ac cording to The Sun, Bill says he could never be persuaded to quit The Street, not even after the recent death of his beloved wife Sara. The 77-year-old actor, who’s played Ken Barlow since very first episode of Corrie way back in December 1960, has said that he plans to be on the cobbles when the cast and crew celebrate the show’s 50th anniversary next year. He said: "I never ever considered retiring. While I can do it, while they want me, I’ll be there. They’ll have to carry me out!" Blimey, it really does look like he’s taking a leaf out of Gordon Brown’s book. But in all seriousness, where would Coronation Street be without the likes of the older characters such as Ken, Blanche, Emily, Betty, Norris and Rita? These actors and actresses are the pillars of The Street which is why I’m glad that Bill Roache plans to stay around for a while. I’m pretty glad that the producers of Coronation Street haven’t gone down the road of pensioning off their older actors (although there were some rumours flying around last year that this may be happening). Since when has there been a rule that only under 40s should be on TV? Take The Bill as an example. Apparently, 57-year-old actor Graham Cole, who’s played the role of lovable Pc Tony Stamp for over 25 years, was recently axed from the show because he didn’t fit the new dynamics. It will see the storylines change and the actors getting younger and sexier (you know, a bit like Hollywoodoaks). Poor old Stampy… what a way to go after 25 years of loyal service! Even EastEnders – for all the youngsters that they bring in, the characters I most enjoy watching are older: Peggy, Pat, Dot and Patrick (although I just about held on to my dinner when Pat and Patrick played hide the salami a couple of years ago). It will be interesting to see how long Ken Barlow manages to stick around – maybe it will be long enough to get his personal telegram from someone else who also refuses to go! That’s it for me, I’m out of here. Join me on Friday for the result of the caption competition plus more soap news and gossip. Got a comment about your favourite soap, this blog or anything else? Share it with me. where in the world is there a police station thats full of young officers only and no oldies? i sure cant think of one. i thought these shows were supposed to be true to life.